Today's mission is to declutter laundry supplies, such as detergents, fabric softeners, dryer sheets, stain pretreaters, bleaches and more. 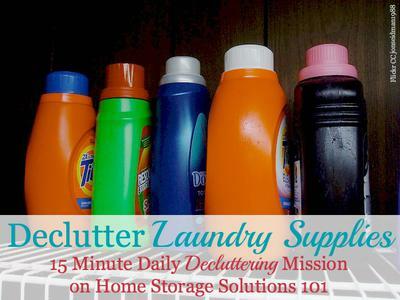 This mission is designed to be done while working on the Laundry Room Organization Challenge here on the site, which is part of the 52 Week Organized Home Challenge. Prime items to declutter include empty bottles (rinse and recycle them when possible), as well as products that you know you will never use because you didn't like them, or whatever other reason you don't enjoy them. If you've got several almost empty bottles or containers you will use make a concerted effort to use the last of these products up to get the packaging out of your home, and then make sure to finish one container completely before opening another next time. In addition, if you don't actually have much storage space for holding supplies in your laundry room, but you have a stockpile of laundry supplies, go ahead and move your stockpile to another area in your home that makes more sense for stockpile storage. Instead, if there isn't much room for supplies around the washer and dryer, only keep the products opened and currently in use in this area. Clearing out space for supplies, and then not overfilling the area will make it much easier to actually get your laundry done, since you aren't moving around things over and over again to get to the items you do want to use. the supplies you do need to get rid of, if you determine you've got an excess that you can't use yourself. Once you've gotten rid of everything you don't want or need anymore, then take a few minutes to organize what is left. This typically doesn't take too long either, and isn't complicated. I suggested keeping all like items together, and perhaps even in the order you use them, such as all the products you use for pretreating or presoaking together in a stain removal and pretreating station, all the stuff you add to the washing machine, and then all of the stuff you add to the dryer. Any of these products can potentially leak or spill, so to make it a bit easier to keep your laundry room or closet clean, you may want to consider keeping them products contained in a basket or tub on the shelf, just to keep any accidental messes from spreading. Keeping these items in a container can also make it more convenient for you when you're pulling things out to use, or when putting everything back away. The before and after pictures to the left were sent in by a reader, Maureen. She got rid of excess products, and then added baskets to hold her various supplies, and also explained that she "added a lower shelf because the top shelf is just too high for me to reach." Great job Maureen! Scroll down to see what more people have done, and get more tips for disposal of excess laundry products. Join in and write your own page! It's easy to do. How? 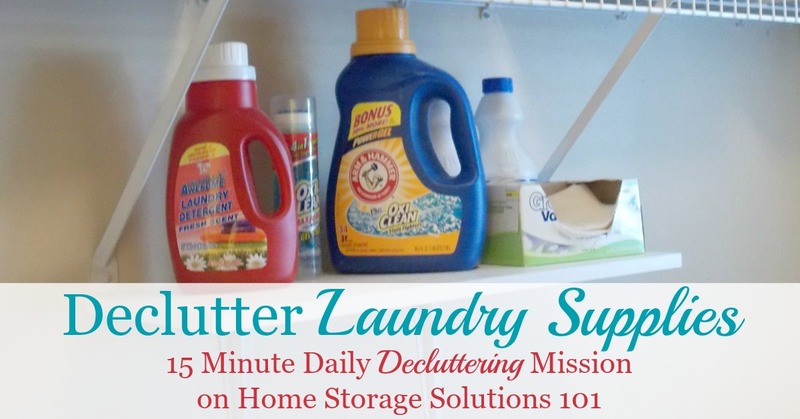 Simply click here to return to cleaning and laundry supplies clutter. 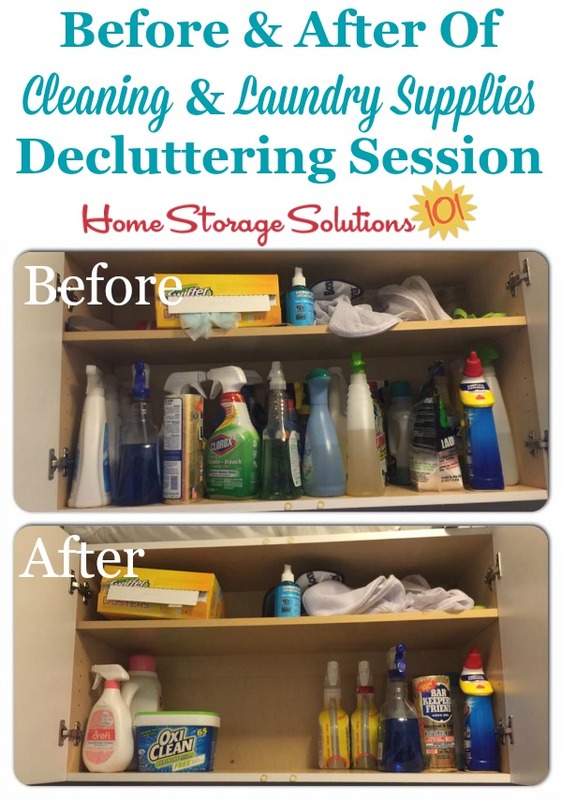 Adrianne sent in this before and after collage showing her results when she did this mission in her cabinet above her washer. She explained, "I tossed all the cleaners older than 2 years and then moved some laundry related things into it. We store all cleaners here to keep out of reach of the kids." Great job Adrianne! Now it is more convenient for you to reach your laundry stuff, plus to find the cleaning products you actually want to use, instead of having to move other older unused cleaners out of the way constantly. If a laundry detergent bottle or product container has never been opened, but you are going to get rid of it, please consider donating it somewhere. These products can be expensive, and are absolutely needed, so recipients are often very appreciative. One of the best place to donate these supplies is to a homeless shelter, women's shelter, or other charity that provides assistance for individuals and families. We all know we need to wash our clothes, so these organizations can almost always make good use of these supplies. Less places will take opened supplies, but it may be worth your time to find one that does. I'm not sure all pet shelters take opened bottles of detergent, but at least one reader shared that her local one did, and that they were appreciative of any supplies people would donate to help them wash pet bedding, blankets, etc., so that's at least an idea. I would love to hear even more ideas from you in the comments of places to donate these types of products, since it can make it feel so much better to declutter when you know you're simultaneously helping someone else! Laundry supplies don't have an indefinite shelf life though. For example, chorine bleach is really only effective for about 6 months before it breaks down. Others have a longer shelf life, but it is not forever. 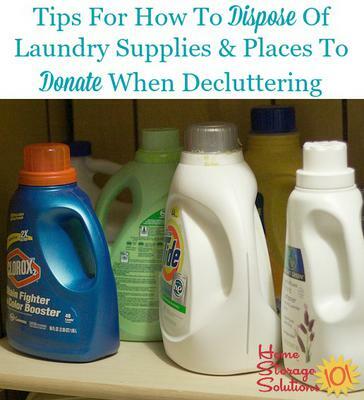 You can find out how to dispose of cleaning and laundry supplies here in this article, along with learning more about the expiration dates for these products, so you can make a decision about whether you will try to donate or just dispose of the products you're decluttering as part of this mission. 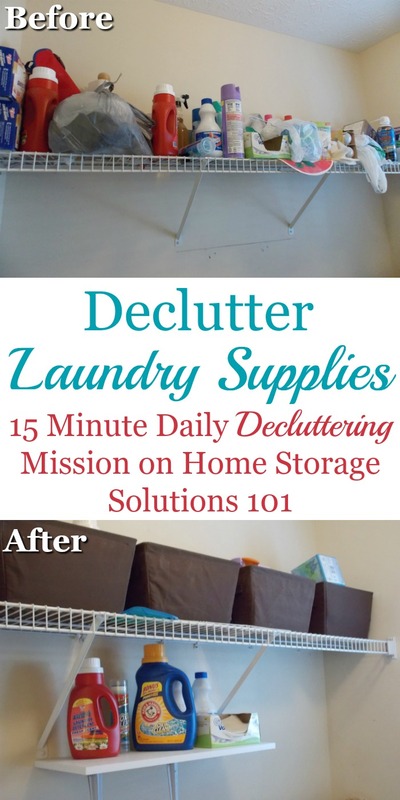 I hope this mission has inspired you to declutter your laundry products and supplies, as well as your entire laundry room.